Audrey Voyles Horsley, 96, of Cloverport, KY, passed away Thursday, October 4, 2018 at Hardinsburg Nursing. Audrey was born October 1921 in Breckinridge County to the late James Percy and Mary Emily Hall Voyles. Besides her parents, her husband, Albert Horsley, whom she married on November 4, 1938, brothers, James Ruben Voyles, Phillip Voyles, Berl Voyles and her sister Eva Belle Smith were waiting for her to join them in heaven. 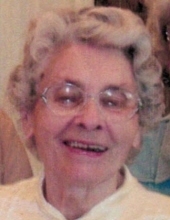 She loved to bake and cook and was an artist when it came to sewing and mending, being with her family and sharing memories and especially reading her Bible. Of these many things that she did and loved, her passion was serving her church and her Lord Jesus. Leaving behind to mourn her passing, but celebrating the life and love that she had lived are her sons, Robert Owen (Faye) Horsley, Hawesville, Jesse Albert Horsley, Paul Wayne (Sharon) Horsley, Max Thaniel (Barbara) Horsley, all of Cloverport; daughter, Mary Jo (Robert) Noble of Cloverport; brothers, Robert Allen Voyles, of Cloverport, Paul Damon (Geneva) Voyles, Tell City, Percy Voyles, Jr, Valley Station; sisters, Daisy Mae (Dwight) Willsey and Anna Laura (Mitchell) Lucas, both of Louisville, 12 grandchildren, 14 great grandchildren and 5 great great grandchildren. A celebration of life will be held 2:00 pm, Monday, October 8 at Wesleyan Church with Pastor Larry Eaton officiating. Burial will follow at Cloverport Cemetery. The family will receive friends and family from 4:00 -8:00 pm Sunday, October 7 at Cloverport Funeral Home and from 10:00 am until 1:30 pm at the funeral home. You may share your thoughts and memories of Audrey with the family on our website; www.cloverportfh.com. To plant a tree in memory of Audrey Voyles Horsley, please visit our Tribute Store. "Email Address" would like to share the life celebration of Audrey Voyles Horsley. Click on the "link" to go to share a favorite memory or leave a condolence message for the family.